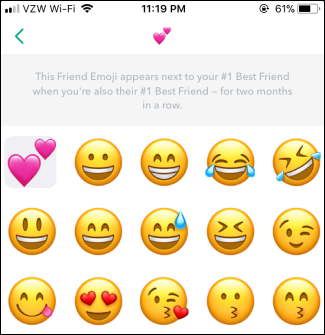 Snapchat has “Friend Emoji” that appear next to friends you stay in touch with the most. Here is your complete guide to all the friend emoji in Snapchat, and what they mean. Snapchat considers a “Best Friend” to be someone to whom you send the most amount of snaps. You can have up to eight Best Friends in your contact list. 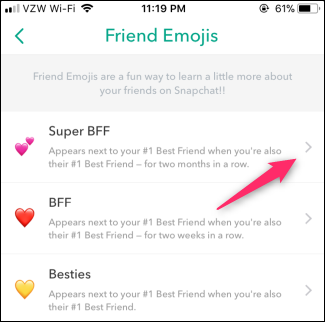 Friend emoji denote the status of your relationship with a friend (which to Snapchat, means variations on the amount of snaps you send to one another). Baby ( ): You just became friends with this person. 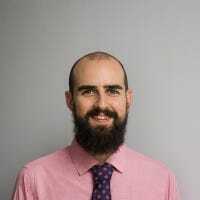 Smiling Face ( ): This person is one of your eight Best Friends (you’ve sent more messages to that person than to anyone else). Gold Heart ( ): This emoji means you and this person are each other’s number one Best Friends. You sent the most message to them, and they sent the most messages to you. Red Heart ( ): You and this person have been each other’s number one Best friends for two weeks in a row. Pink Hearts ( ): You and this person have been each other’s number one Best Friends for two months in a row. Smirking Face ( ): You are this person’s Best Friends but they aren’t yours. In other words, they’ve sent the most messages to you, but you’ve sent the most messages to someone else. Grimace Face ( _: You share a Best Friend with this person. In other words, their Best Friend is also your Best Friend. Sunglasses Face ( ): You share a Close Friend with this person. One of your eight Best Friends is also one of this person’s eight Best Friends. Fire ( ): You and this person are on a Snapstreak. Next to this emoji, you’ll also see the number of days you and this person have snapped in a row. If one of you go 24 hours without snapping the other, the Snapstreak will end. 100 ( ): You and this person have maintained a Snapstreak for 100 days. Hourglass ( ): Your Snapstreak is going to end soon. Send a Snap, not a chat, if you want the streak to continue. Birthday Cake ( ): This friend was born today. Most people use the default friend emoji, but you don’t have to. 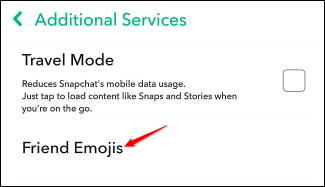 If you don’t like any of the default emoji, you can set up custom emoji that might suit you better. On the main screen of the Snapchat app, tap your profile picture at the top left. On the profile page, tap the cog wheel at the top right. On the Settings page, scroll down to the “Additional Services” section, and then tap the “Manage” option. Tap “Friend Emojis” to personalize the emojis you see next to your Best Friends. On the Friend Emojis page, tap the Friend Emoji you want to customize. Tap the new emoji you want to use, and then tap the Back arrow to save the setting. Snapchat friend emoji are a fun way to keep track of your friendships inside the app. They’re completely private to each user, unlike the older best friends feature that used to be in its place, so you don’t have to worry about upsetting anyone outside your top eight.